A new Doctor on Doctor Who means new everything: new monsters, new best friends, new TARDISes, and new gear. That includes a new Sonic Screwdriver, the Doctor’s jack-of-all-trades technological device—and while we got a very tiny flash of it in the new trailer today, we now have a great look at its very unusual visage. 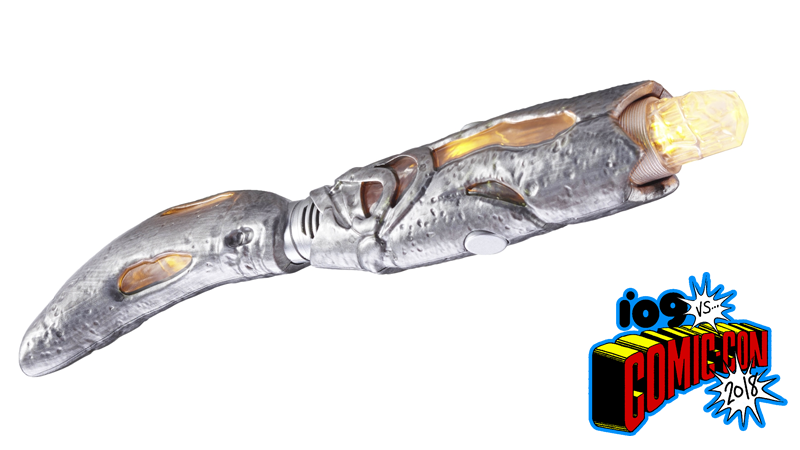 Naturally, it’s because the Thirteenth Doctor’s Sonic Screwdriver is now a toy to tie into the upcoming series, and actually available for purchase at Comic-Con. If you’re not at the show, the 7.4-inch-long toy will hit shelves in August, ahead of Doctor Who’s highly-anticipated return later this year. While the toy itself is pretty nifty—it lights up, just like the one on the show, and makes all the appropriately buzzy sonic screwdriver noises you’d hope it would make (it also rotates!). But it’s surprising from a design standpoint just how, well, alien this new sonic is. It looks weirdly organic, from the crystal light source to the metallic shell, and the fact that it curves and twists instead of being a straight little technological equivalent of a magic wand. It looks organic and bizarre in a way the sonic screwdriver never has before. A fancy new sonic screwdriver needs a similarly fancy box. Past versions of the device, especially in the modern revival of Who, have meant to share a design link with the TARDIS console room that created the device—sharing similarities in aesthetic and coloration with the current “desktop theme” of the Doctor’s ship. Could this ethereal-looking sonic give us a hint that the Thirteenth Doctor’s TARDIS console room could look equally funky? She definitely needs a new one after the whole “getting thrown out of the TARDIS mid-air while its insides exploded” thing in the last Christmas special! Doctor Who returns this autumn. If you want the Doctor’s latest gadget for yourself and aren’t currently vworp-ing your way across time and space to San Diego, it’ll be available for pre-order from next Wednesday, July 25, at the BBC Shop and Hot Topic.